The upheaval that accompanied the migration of European peoples of late antiquity shattered the power of the Roman Empire and consequently the entire political order of Europe. Although Germanic kingdoms replaced Rome, the culture of late antiquity, especially Christianity, continued to have an effect and defined the early Middle Ages. Concurrent to the developments in the Christian West, in Arabia the Prophet Muhammad in the seventh century founded Islam, a new religion with immense political and military effectiveness. Within a very short time, great Islamic empires developed from the Iberian Peninsula and the Maghreb to India and Central Asia, with centers such as Cordoba, Cairo, Baghdad, and Samarkand. 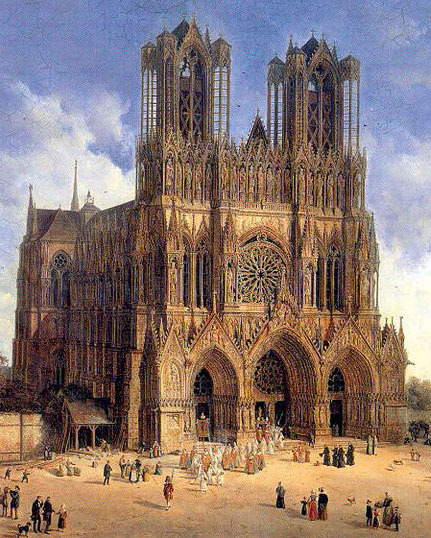 The Cathedral Notre Dame de Reims, built in the 1 3th�14th century in the Gothic style; the cathedral served for many centuries as the location for the ceremonial coronation of the French king. ��.15�� CENTURY B.C.-15TH CENTURY A.D.
After the settling of the Americas, various cultures developed in North America, some of which were culturally very sophisticated. Predominantly hierarchically organized empires developed in Central and South America, each of which took over the political and cultural leadership of the region for a certain time. These included the empires of the 1 Olmec and Toltec as well as the Maya and Aztec in Central America and of the Chimu, Chavin, Moche, Nazca, and finally the Inca in South America. A large number of diverse American Indian cultures characterized the northern continent. Nomadic Stone Age hunter-gatherers moved into North America toward the end of the last ice age, roughly 13,000 B.C., across a land bridge that existed at the time between Asia and America. They spread out over the entirety of the Americas in the course of the following millennia. Around 300 B.C., members of the Hohokam cultures migrated northward from Mexico and settled in villages whose agricultural areas wrere irrigated by large-scale canal systems. The various American cultures flourished from the beginning of the Christian era until the eighth century. 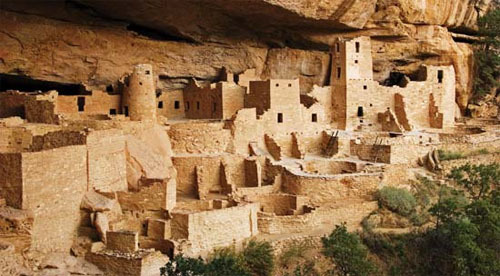 The 6 cliff-dwelling 3 Anasazi culture devel oped around 500 a.d. in the American Southwest. 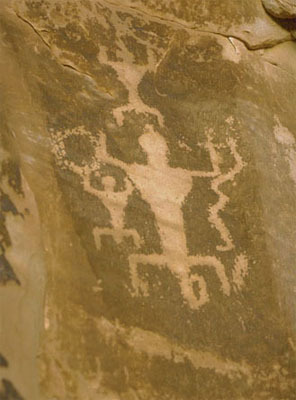 3 Beautiful art works of the Anasazi culture. They were settled agriculturalists who dwelled in multistory stone houses and are the predecessors of the 5 Pueblo Indians, who were then conquered by the Spanish in the 16th century. that many Indian cultures met. Tribes on the northwest coast existed by fishing, pursued trade with northern Asia, and held potlatches�complex gift-giving rituals which distinguished many of them. 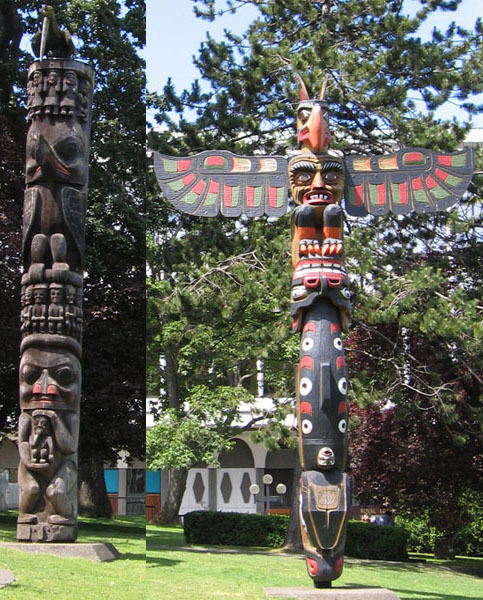 They arc also known for their wood carvings, particularly their totem poles. 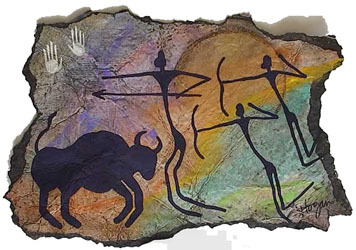 The 4 tribes of the Great Plains were for the most part nomads, their culture dependent on the 2 hunting of bison. As they more frequently came into contact with white settlers pushing westward, they were mistakenly thought to be typical of Indian cultures. The lifestyles, social organizations, and political institutions of the Native Americans were very diverse. These were partly determined by the living conditions such as climate, terrain, and animal population, but even in similar environments there was a great diversity of social structures: settled and nomadic peoples with or without slaves, hunter and agrarian cultures, patriarchal and matriarchal societies, monarchical and democratic structures. The Wendat (Huron) confederations in the 15th century, and later the five-nation Iroquois League, had a parliament and constituted the first American democracy. Sophisticated state-building civilizations developed in Mexico and Peru, some of which covered vast territories. The nomadic hunter-gatherer communities of Central America became settled agrarian societies about 8000-9000 years ago. The Olmec formed the first advanced civilization; they left behind temple complexes and palaces from about 1200 B.C. 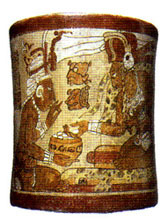 The Olmec culture was dominant on the Mexican east coast until about 400 B.C. This culture was long considered to be the oldest in the Americas until 2001 when a city dating back to around 2700 B.C., and testifying to a sophisticated society that built pyramids as old as those of Egypt, was discovered in Caral, Peru. Approximately 2000 years ago, a nation developed around the city of Teotihuacan not far from modern-day Mexico City, and it dominated Mexico from 450 to 700. The city at times had more than 100,000 inhabitants and a widespread trading network. It housed 11 sun and moon pyramids as well as numerous colorfully painted temples lining a wide thoroughfare. Between 400 and 1200 A.D., the Toltec formed a militarily organized empire in the interior of Mexico, the first in Central America to use an army to subjugate its neighbors. In the twelfth century their empire fell, and the rise of the Aztec began in the ensuing decades. The Maya peoples had been laying out settlements on the Yucatan Peninsula since 1200 B.C. Between 300 and 900 A.D., the Classic 13 Maya period, numerous 12 city-states ruled by 8 priest-princes formed on the peninsula. For reasons unknown, these were given up in favor of the cities of the Postclassic Period, which were situated further north. In South America almost 3000 years ago, the Chavin culture emerged in Peru. It lasted into the third century B.C. 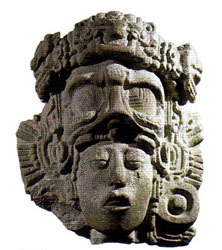 and was replaced by the Mochica or Moche in the north and in the south by the Nazca. The latter, famous for the sixth or seventh century. Between 300 and 900, the civilization of the 9 Tiahuanaco dominated the region around Lake Titicaca, which was possibly developed from the earlier Chavin culture and which influenced the Huari empire that ruled Peru from the seventh to eleventh centuries. The 7 Mochica built temples and pyramids that are among the largest in the Americas and created characteristic pottery that occasionally depicted human sacrifice. 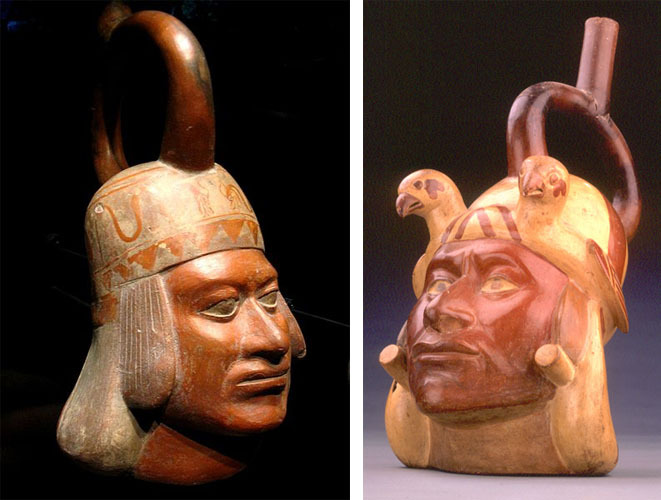 7 Moche portraits vessel in the shape of a head, clay, first �. �.�.-sixth �. A.D. They gave up their cities at the beginning of the eighth century. The Chimu, who had an intricate irrigation system, succeeded them about 200 years later on the Peruvian coast. Their empire and its capital Chan Chan, which had around 50,000 inhabitants, was conquered by the Inca in 1470. The 10 Amazon region was first settled by humans in the third millennium B.C. The people occupying the southern tip of South America nearly 10,000 years ago were almost completely eradicated by colonization and epidemics.